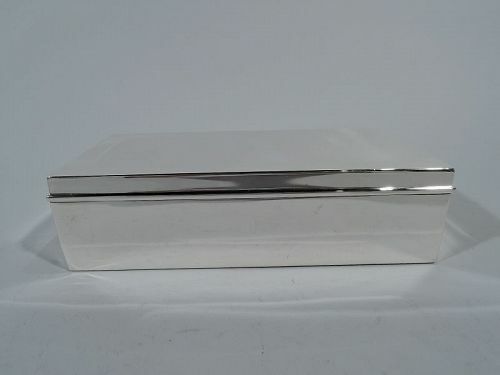 Smart and Modern sterling silver desk box. 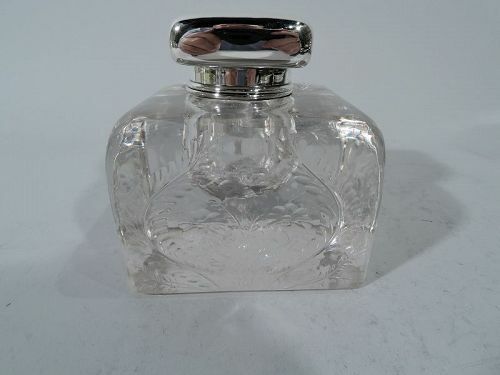 Made by Tiffany & Co. in New York, ca 1936. Rectangular with straight sides and sharp corners. Cover hinged with molded rim. Box interior cedar lined. Hallmark includes pattern no. 22353 (first produced in 1936) and director’s letter m (1907-47). Very good condition. 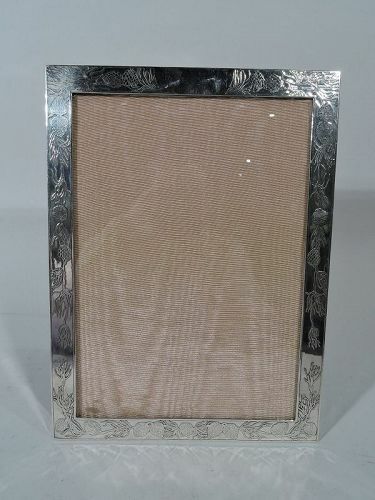 Art Nouveau sterling silver picture frame. Made by Tiffany & Co. in New York. Rectangular window with acid-etched surround and sides: Hallucinatory, semi-abstract ornament in form of vegetation joined by dense and interlaced tendrils. With glass, silk lining, and cloth-bound back and hinged support. Hallmark includes pattern no. 16544 and director’s letter C (1902-7). Very good condition. 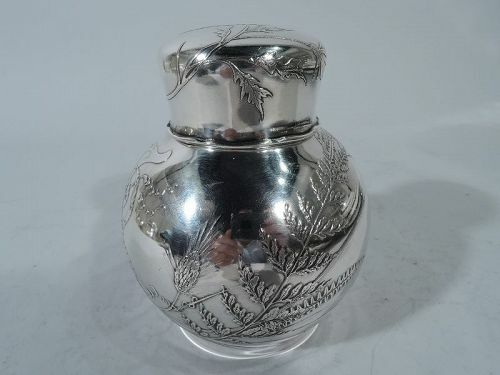 Edwardian glass and sterling silver inkwell. Made by Tiffany & Co. in New York. Rectilinear clear glass block engraved with ferns and flowers. Short neck has sterling silver collar with hinged square cover. Hallmark includes pattern no. 17360 (first produced in 1909) and director’s letter m (1907-47). Very good condition. 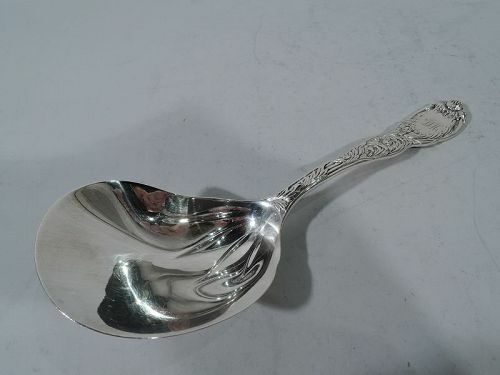 Antique sterling silver berry spoon in Chrysanthemum pattern. Made by Tiffany & Co. in New York. Conch-shell bowl. Script monogram. An early piece in the classic Japonesque flatware pattern that was first produced in 1880. Hallmarked. Very good condition. 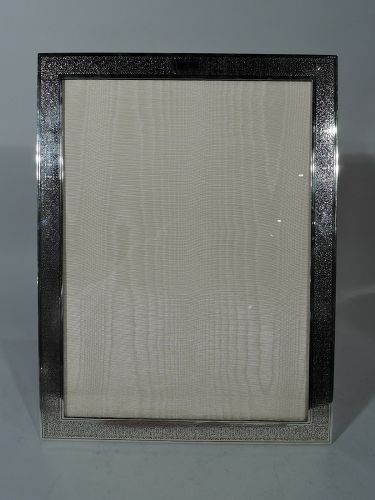 Large sterling silver picture frame. Made by Tiffany & Co. in New York, ca 1931. Rectangular window with flat border. Allover fine ornament – pointille at a distance with subtle repeating squares. Plain rectangular tablet (vacant). With glass, silk lining, stained-wood back, and hinged silver support. Hallmark includes pattern no. 21766C (first produced in 1931) and director’s letter m (1907-47). Very good condition. 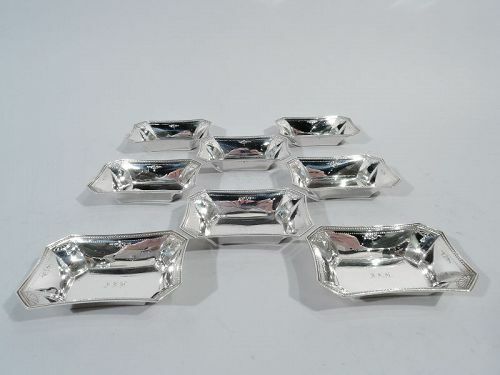 Set of 8 Edwardian Neoclassical sterling silver nut dishes. Made by Tiffany & Co. in New York, ca 1917. Each: Four tapering sides with chamfered corners. Interior decorated with bead-and-reel, beading, and paterae. Engraved monogram. Elegant and restrained. Hallmark includes pattern no. 19209 (first produced in 1917) and director’s letter m (1907-47). Very good condition. 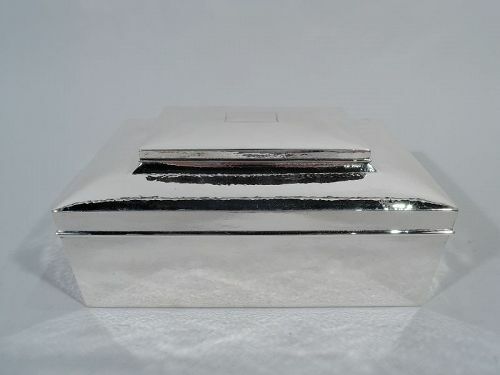 Large and shimmering hand-hammered sterling silver jewelry box. Retailed by Tiffany & Co. in New York, ca 1910. Rectangular with straight sides and sharp corners. Cover hinged and raised with molded rim and inset small compartment, which also has a raised and hinged cover as well as a plain rectangular frame (vacant). Box and compartment interior velvet-lined, and both covers have gilt interior. Hallmarked. Very good condition. 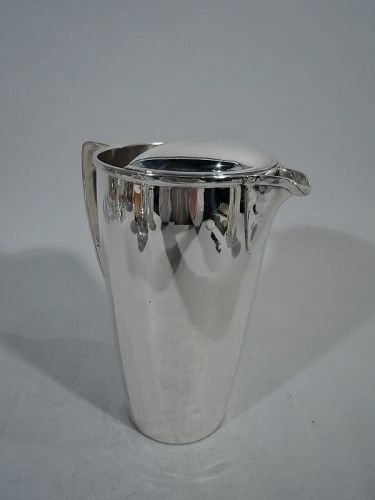 Classic Midcentury Modern sterling silver bar pitcher. Made by Tiffany & Co. in New York. Gently curved and tapering sides, scrolled bracket handle, and soft u-spout with built-in strainer. Open top with demi-lune ice guard. Hallmark includes pattern no. 23058 and director’s letter M (1947-56). Good condition. 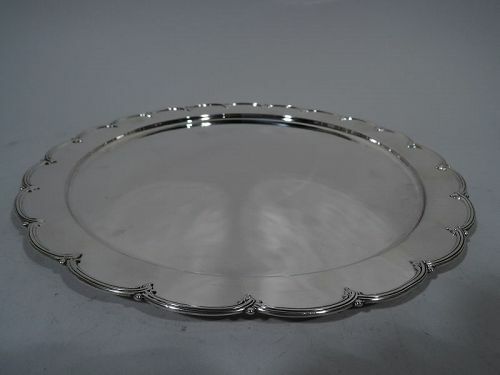 Sterling silver serving tray. Made by Tiffany & Co. in New York. Plain circular well. Rim has dense ornament with alternating scallop sells and scrolls. Hallmark includes no. 5766 and director’s letter T (1892-1902). Fine condition. 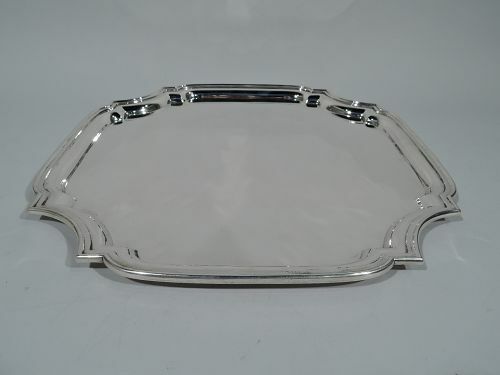 Edwardian Sterling silver serving tray. Made by Tiffany & Co. in New York. Circular well and petal-scalloped rim with applied reeding. Hallmark includes pattern no. 13562 and director’s letter C (1902-7). Very good condition. 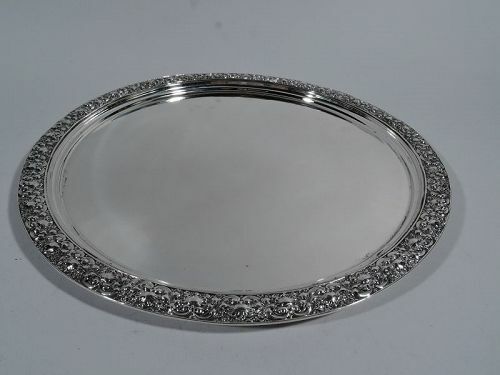 Classic Georgian-style sterling silver cartouche tray. Made by Tiffany & Co. in New York. Four sides with concave corners and molded rim. Hallmark includes postwar pattern no. 25146. Very good condition.